Just a quick question. This will allow me to put the posses I downloaded into pack to use with the pose player? If so is there any regulations on the whole code thing? Meaning if I combine all my cute cuddle ones that use the seated kiss code will there be conflicts or will they just rotate? Hi psychosim, welcome to Studio forums. Unfortunately, the pose player cannot play seated poses yet. 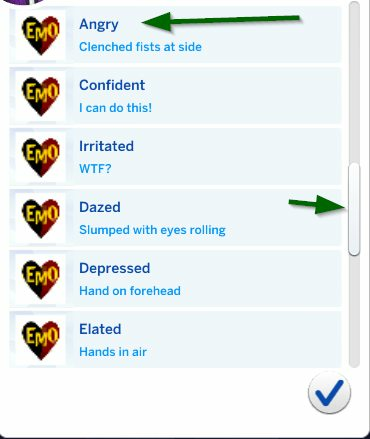 The Sim must be standing to trigger a pose and if you try to move furniture under them while they're paused they will reset out of the pose. This problem is under investigation but for now there is no solution. To take a pose that was not made for the pose player and put it into a clip pack so it will play using the pose by pack feature of pose player you will need to open the original pose and export the clip. Then you need to import that clip into your new pose pack.package. I figured that part out but just by playing around with it I can see the possibilities are endless once that can be figured out. Combine the female pose a with the male pose b and you got a new pose!!! (c: So that is exciting!!! I get this error everytime i try to import .blend files. How can I fix it? No need to reply heheh. Found out that the problem is the locrot thingy. I made a child pose pack, but it won't run in-game. What can I do to make it run? ??? Hi EbonixSims I haven't done any child poses but Ansett Animation has, so maybe he can give you a hand with this. Perhaps you can upload your package? Do other e.g. adult poses in your pose pack work? What about the sample poses provided in Andrew's creator studio? Hi fufu508.. I figured it out. I had to re-re-download the pose player in order for it to work. Hi milrer, welcome to Studio forums. The error message is saying that your pose/animation does not have keyframes set. Please refer to the pose tutorials in this forum to see how to set keyframes. If you still have questions after reading them I hope you will feel welcome to post again. Edit: I figured it out. The pics were 64 x 85 I'm not sure how that happened because I doubled checked to make sure that it was 64 x 64. I re-sized them again and the pics are now showing. Hi kara11 , you included orangemittens ' post in a quote within your post. I didn't see your question. Can you ask your question again, please? Hi andrew , it seems there is a limit of 6 clips per pose pack visible in game. Is the scroll bar function broken? 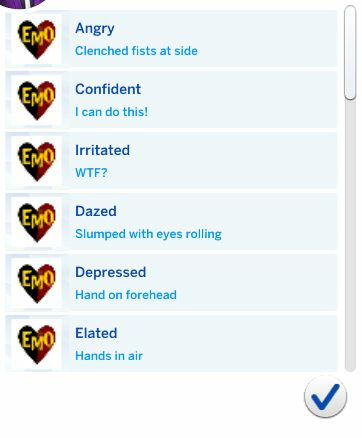 Here is an example of the Emo package which lists 23 clips.